If The Hat's original road side stand on the corner of Garfield and Valley in Alhambra looks like it's been there since the 50's, that's because it has. It's nothing but a beaten-down shack, with a walk-up window. Behind the building, in the parking lot, there are a few worn tables where you can sit and stuff your face with pastrami. The fact that it still remains in that same location to this very day is a testament to its endurance as the city and the whole San Gabriel Valley transforms itself into L.A.'s largest Chinese enclave. That stand seems to be one of those unique, distinctly L.A. joints that have stood the test of time. In this club are places like Pink's Hot Dogs and Philippe's French Dip. However, unlike Pink's and Philippe's, The Hat has apparently decided to expand and franchise itself beyond the L.A. County line. There are eight other outposts including one in Brea and Upland. The newer stores are not mere walk-up windows though. The Lake Forest outlet's got a full-on dining room. But the menu board still has that distinctive white lettering over the ugly brown wood pattern; the kind they used to use on TVs and clock radios manufactured in the 70's. Brown, it seems, is the predominant color scheme of the restaurant. And everyone orders the Pastrami Dip sandwich. Everyone. The sandwich is a two-fisted affair. Served on food trays reconstituted from recycled newspaper pulp, a soft hoagie roll is stuffed, nay, crammed with heaps upon heaps of shredded pastrami; beefy red ribbons of stringy meat and fat. It's chewy, bordering on rubbery, but it's good and salty like pastrami should be. The plain old yellow mustard and lip-puckeringly sour slices of pickle help to cut through the richness. Pastrami purists will probably say that it doesn't hold a candle to Langer's. And they're probably right. But until Langer's decides to whore itself to the masses in O.C. and the Inland Empire, The Hat's here to fill the void. The sandwich, by the way, ain't cheap. At exactly $7.00 with tax, it's not exactly as cost effective as the banh mi. But then, ask anyone eating at The Hat in Lake Forest what they think of banh mi, and they'll likely say "Ban you? Why? What'd you do wrong?" Hi Elmo - I love the Hat; but my artieries...they say Nay!!!! Just try to keep your hands "clean" there is a challenge. "But until Langer's decides to whore itself to the masses in O.C. and the Inland Empire, The Hat's here to fill the void." Great line. Not much of a pastrami fan, so the Hat isnt my joint but I know of its reputation. Nothin' better for your stomach and nothin' worse for your heart than a fistful of pastrami! Eventhough I like The Hat's Pastrami a lot, I still wonder if Langer's is all that everyone says it is. One thing's for sure though, pastrami puts me into a food coma like no other sandwich can. Must be all that sodium and fat. Nothing says 'comfort food' like a huge pastrami sandwich. It's the epitome of anti-Southern California food--which endears me to it even more. Now as far as I'm concerned, if you want to go on full life support? throw in some well-done crispy fries and some good cole slaw! Oh, and don't forget to top it off with a good Kosher dill. Oh yes...Fries, coleslaw to complete the trifecta. But one thing that I think The Hat should do that Tummy Stuffers (a sandwich shop I used to frequent in Costa Mesa) does is put a few slices of crisp bacon in the pastrami...now THAT's a SANDWICH! I'd rather go to the Hat over Phillipe's (overrated). The hat serves a pretty fat french/pastrami dip. (I even drink the au jus haha). Warning to those interested in getting their chili fries: You Will Not Be Able to finish that 4 lb. meal. It's huge. I would have to disagree with Dylan. Phillipes is GREAT for a French Dipped Sandwich! Not the place for pastrami though. Haven't been to the Hat in ages, and I think Langer's is all right. I still prefer Johnny's right next to Tito's. Another favorite o'mine! 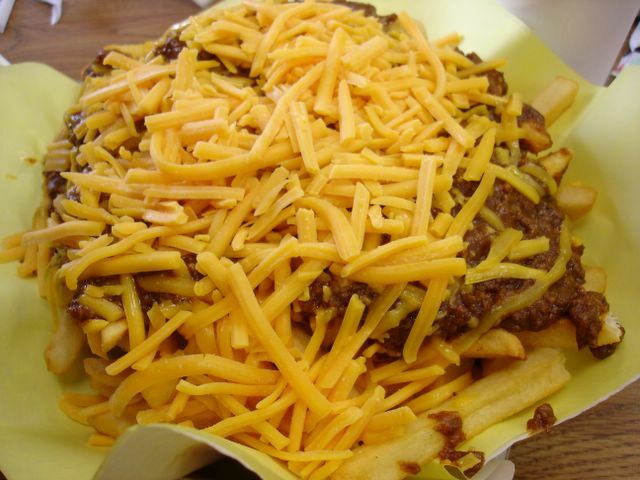 I agree with you on the chili fries. We didn't know about how ginormous it would be. It was certainly too much for two people to finish...I mean LOOK AT IT! The fries were a little soggy though...even the ones which were untouched by chili. I like Philippe's too. Their lamb sandwich is the only thing I get (the fitting receptacle for the hot mustard). Though I never cared too much for the Beef dip. My favorite pastrami sandwich is the ones with cream cheese. Pastrami is my favorite of any kind of sandwich. Cream cheese eh? Now that's one decadent sandwich. And I thought my addition of bacon was genius! Banh mi? Ban you...for writing such a tight article. You're making the rest of us look bad! Great work! Hope your Turkey Day was delicioso. This sandwich was awesome alright...since I ate no turkey, I think I'd be up to getting more pastrami to make it up! Make you look bad? Not "bloody" likely! Pun intended! Hope you had a good turkey day as well! Can't wait till they put your "bloody" broadcast on the KCRW website. Why eat at The Hat in Lake Forest when Thanh Binh, the best Vietnamese restaurant in Orange County south of Irvine, is right across the street? Reminishing about some of my best childhood experiences, I told my girlfriend about eating French Dipped Pastrami sandwitches at The Hat with my family. We moved from CA in 1955. Can't believe it's still going. Pastrami Fan? No. but they have the very best Chili burger ever!!! Yes, I LOVE the Hat's pastrami sandwiches. I always get it 'double dipped'. 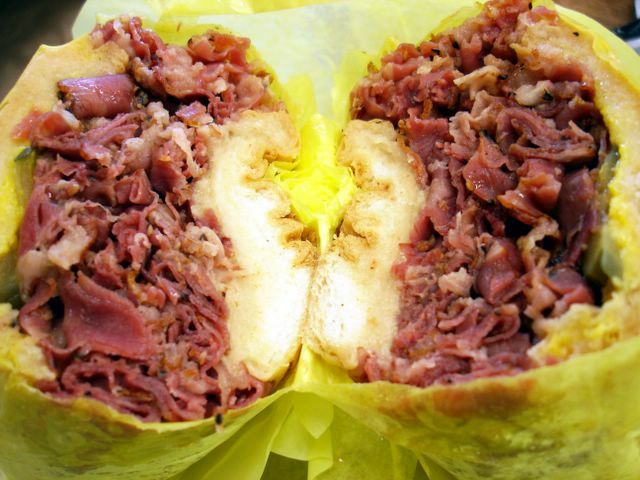 Plus, all the pastrami purists always mention Langers. I tried Langer's several years ago. So-so. I wasn't that impressed. I would admit that their pastrami was probably higher quality but the overall sandwich and taste for me goes to 'The Hat'. One other pastrami sandwich I like is the huge pastrami sandwich from Giamela's (there's one in Burbank, one in Silver Lake). I share the pastrami, and an order of chili cheese fries every time! For those who have eaten at Langers, is the pastrami served sliced nice and thin? Togo's serves a pretty good pastrami too. Their pastrami has less fat than The Hat and seems to have a more pepper flavor. i've been to several hats in socal and this one in lake forest is the worst. maybe it is the management but the employees do not really seem to care about the quality of the sandwiches and fries. i once ordered pastrami sandwiches and fries with gravy and it was terrible. it was cold and tasteless. every single time i go to the hat in brea i am assured a good meal but the one in lake forest is just not up to par.